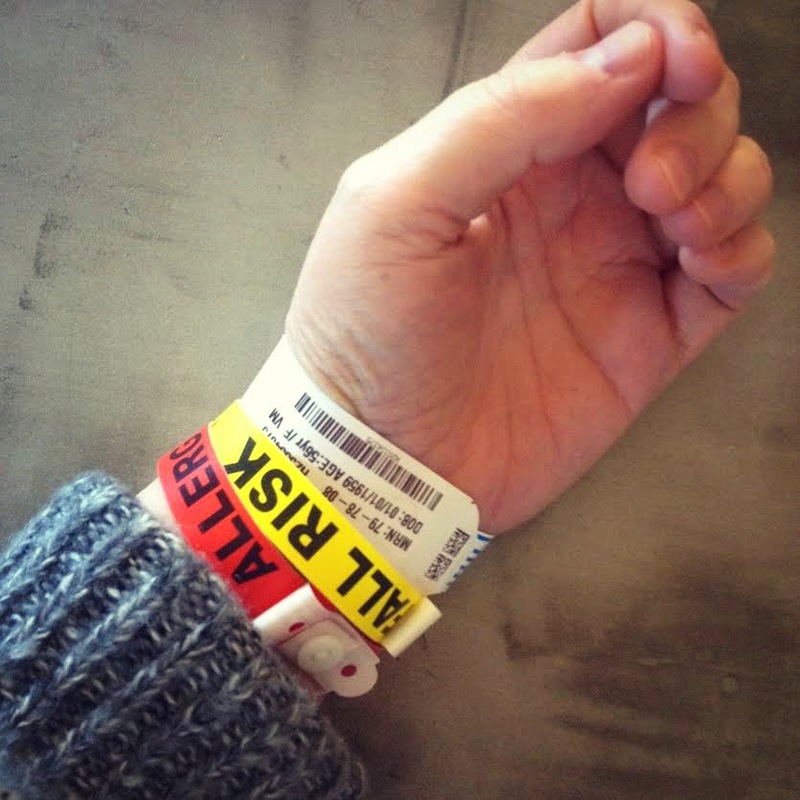 One good thing about my stay at the hospital: more wristbands than a weekend at Coachella. I'm sorry but there is only one way to say this. We are finished. And I have to be honest. It's not my fault. I blame you entirely for ruining our relationship. Sure, in the beginning, we had a great time together. Soft and pliable, you were so easy to get along with. Patiently storing up your magically helpful bile and discretely secreting it into my small intestine at just the right moments, you helped me break down all the yummy fats in my diet and extract the maximum nutrients. You were the strong, silent type back then, and I fell for you right away. But there, deep in the dark quiet of my abdomen, you betrayed me. Behind my back, you began to process that innocent bile into evil gallstones. Year after year - for decades! - you deceived me into thinking that everything was fine between us. But secretly, you stockpiled those square-sided, sickly yellow stones until there were literally hundreds and hundreds crammed into your smooth gray-green pouch. Oh sure, looking back now, I can see the warning signs that I missed along the way. All those screaming cramps in my abdomen and ribs - accompanied by radiating pain up into my shoulders and back - repeatedly struck me down with unrelenting agony. I blamed everyone and everything else for my problems - my food choices, my touchy stomach, even my stress level. But I gave you a free pass, never suspecting that you would be the one to hurt me so cruelly. It was early this month that I could no longer make excuses for you. After 48 hours of torment, I dragged myself to an emergency room, still breezily blaming others for your transgressions. Could be a stomach ulcer, I rationalized, or maybe my appendix. But the ER doc took one look at me and with the instincts of a practiced marriage counselor, guessed exactly what was wrong. Pressing just so on the right upper quadrant of my abdomen, he watched knowingly as I gasped in pain and suddenly realized the truth. "That," the doctor said to me, "means that you probably have a sick gallbladder." I was utterly and completely caught off guard. Because I never suspected this treachery of you, my gall bladder. Never in my wildest dreams. Fifteen minutes later, hopped up on oxycodone and whirling with heartbreak and confusion, I saw with my own two eyes the proof of your deception. An ultrasound image. A wavering grey outline of your shadowy shape, apparently filled to the half-way mark with bright, gleaming stones. Far too many to count. My unquestioning love for you changed in that moment, instantly and forever. A week later, I sat down with a surgeon who told me, "It's time. You need to get rid of your gallbladder right away." And I knew he spoke the truth, even though his words cut me like a knife. With the reassuring ease of a good divorce lawyer, he explained that our incompatibility most likely went back to the days of my first pregnancy, when wild waves of estrogen changed the chemical composition of my bile and influenced you to begin stone production. And when I noted that there seemed to be a family propensity for gall bladder disease, he clucked his tongue in sympathy and consoled me. "This surgery has been a long time coming. You'll feel so much better when it's done." Deep in my heart, I knew he was right. But on the night before my laparoscopic procedure, I mourned for the end of our relationship. I wasn't sure if I was ready to let you go. But as I fought to make my peace with your leaving, I held on to one last, comforting thought. At least, I reminded myself, the pain is finally over. After tonight, my gallbladder will never have the power to hurt me again. Little did I know that you had more agony in store for me. During the surgery, my good doctor discovered that your cursed supply of stones not only filled the inflamed and acutely sick gallbladder to the very top, but also spilled out into my swollen and distorted cystic duct and even on into the adjoining common bile duct. A second procedure would be required to clean out every last trace of your damage. And so, even though your diseased pouch had already been unceremoniously removed and whisked off to a pathology lab, the final remains of your treachery would remain in my body for one more afternoon and evening of torment. In those last twelve hours of misery, I came to hate you with every fiber of my being. Thankfully, my miracle-working medical team eventually got a handle of my pain, and the next day, removed every last trace of your handiwork. I am now permanently free of you, my gallbladder, and every wicked stone that you ever created. I forgive you for what you did to me, but only because I choose not to carry any memories of our sad and broken relationship forward into my bright and shining future. I am so much better off without you. And I wish you plenty of luck in your new life as a lab specimen. Have fun with that.